Friday 13th give rise to dramas as well as surprises, luck and bad luck. This is what emerges from the stories that follow below, to discover this second Friday thirteenth of the year, July 13, 2018. So, whether you play lotto or go on a cruise, that you take the plane or you are about to declare your love to the chosen of your heart, the suspense stays put on the outcome of your adventure. Superstitions such as those related to Friday 13th, the black cat we meet, the four-leaf clover, etc. act as cultural landmarks. They connect us to traditions whose origins we do not know much about but which are passed down from generation to generation. These superstitions also connect us to the irrational part that we have in each of us and that we need. Because it is an open door on the imaginary, in a space where we can create everything. In today’s world, everyone is called to feel responsible for themselves and their existence, to take their destiny in hand, to decide the direction to give to their life. We have to manage and constantly rationalize. Superstitions act as a parenthesis, as a reminder of our belonging to a world that often embraces and transcends us. Friday thirteenth connects us to that part of irrationality which is in us and which is indispensable to us. The bad reputation of Friday 13th is based largely on beliefs related to the Bible and the Gospels, some related to Friday, others to 13. It is likely that Christ died crucified on a Friday, even though the exact date of his death is not known to historians. A fairly common opinion, though far-fetched, would be that Adam and Eve crunched the apple on a Friday. 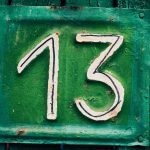 As for the number 13 itself, its bad reputation would come partly from the fact that at the last meal of Christ, also called the Last Supper; there were 13 apostles at the table until Judas left to accomplish his betrayal. In Nordic mythology, there is also a fatal dinner between the gods in which a thirteenth guest, the god of evil, surprises and kills the son of the valiant god Odin warriors. Friday is also the holy day of Islam, the day dedicated to collective prayer, while the Jews dedicate it to the preparation of the Sabbath. Suffice to say that Friday does not leave many people indifferent. In addition to the symbolism associated with the Last Supper, historians point to a pagan rural belief around 13 lunar cycles between the “death” of nature in winter and its “rebirth” in the spring. A symbolic also very close to the 13th arcane tarot Marseille, representing Death with his forgery, interpreted as the end of a cycle, but also as the beginning of a renewal. As for the Greeks and the Romans, for them, 13 is the number which, by its unity, breaks the harmony that the number 12 is supposed to represent. Thus, the two mythologies attribute to it a deleterious effect. Except that, among the Romans, Friday, the day of Venus, goddess of love and beauty, has a very positive connotation. Incense to attract love: when can it help you?